This week's topic from The Broke and Bookish is: Top Ten Books on My Winter TBR. 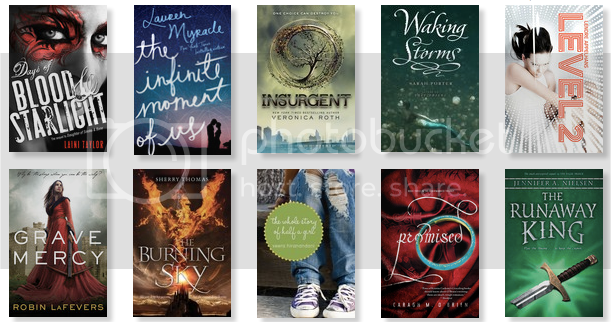 Here they are - these are the 10 books that I am so excited to read next. Yup, plenty of sequels to series I've already started, and a few new series to start as well. I'm reading The Infinite Moment of Us for my book club. With any luck, I'll tear this this set of 10 books by the end of the year! I read The Burning Sky because my cousin recommended it to me. At first I was iffy about it but then I was blowing through the pages. It's a great read! I loved the cover... and then I started hearing great review of it. Now I definitely have to read Burning Sky. I hadn't noticed, until your comment, they are mostly green and red! I must have Christmas on the brain. Yes, Grave Mercy is an amazing book, one of my all time favorites actually. I hope you love it! Also, Insurgent is a pretty great book, the ending kind of blew my mind. I've been hearing lots of mixed reviews about the ending! As far as Days of Blood and Starlight - I know, right. I think when I start reading it, I'll just feel like I'm falling in love with the whole world all over again. Great list! I really need to start the Daughter of Smoke and Bone series, that made my list and I can't wait to finally read it.I hope you get to read them all. My TTT. You really do need to start that series! Daughter of Smoke and Bone is one my favorite books ever.